As a loving dog parent, it’s a top priority for you to make sure your pups feel their best. Chances are your dog’s primary concern is making sure he receives the tastiest of treats. Homemade CBD dog treats can give you the best of both worlds – a yummy snack your dog will crave packed with an array of natural health benefits. CBD, or Cannabidiol, is an all-natural compound derived from Hemp or Marijuana plants. It’s known for its diverse potential for improving health in both humans and animals. CBD Oil is highly safe and doesn’t produce the harsh side effects of traditional medications. While Cannabis plants are typically associated with producing a “high,” pure CBD Oil has no psychoactive effects at all. That’s because it contains zero to 0.3 percent of THC. It’s commonly given to pets like a daily supplement with the goal of relieving symptoms of illness, reducing pain and improving behavioral wellness. What are the benefits of CBD Oil for dogs? 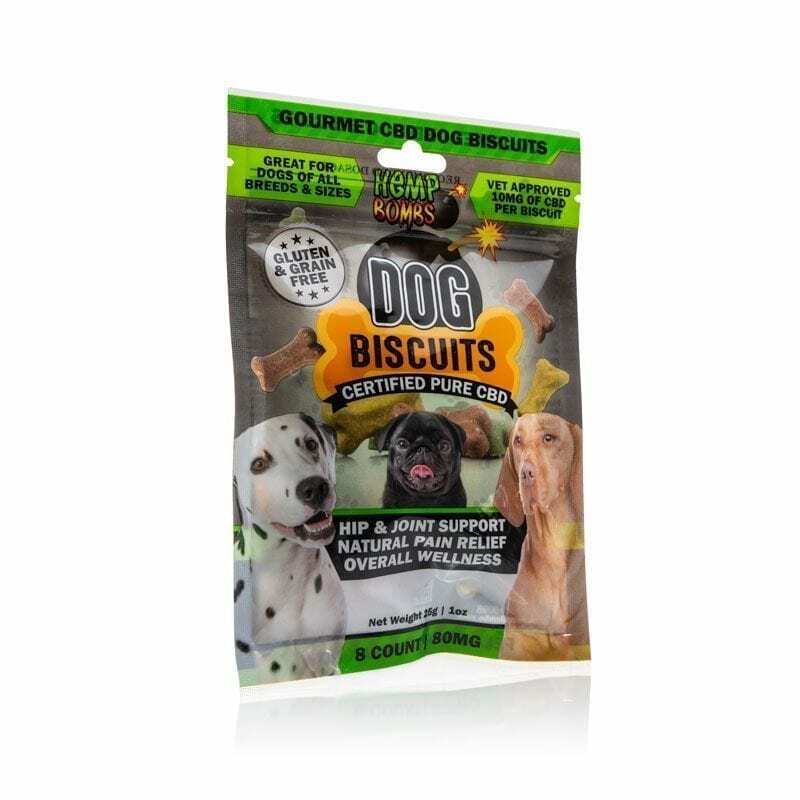 Add Pet CBD Oil to an existing treat. We’ll start with the easiest option. Pet CBD Oil can be combined with many existing treats. Simply add the drops atop your dog’s favorite biscuit for easy and yummy administration. We recommend choosing a dry, crunchy biscuit for best absorption. You can also get creative by cutting a hole in a piece of cheese or a chunk of apple and dispensing the drops inside. “Pupsicles,” or popsicles for dogs, are simple to make and very appreciated by our furry friends. All you need is an ice cube tray and some ingredients you likely already have in your pantry or fridge. Start by choosing a few dog-friendly ingredients you can easily mix with a spoon, like classic peanut butter, unsweetened apple sauce, plain yogurt or low-sodium chicken broth. Add your ingredients to a small mixing bowl and stir together. You can also add a few small pieces of chopped up dog-friendly fruits and vegetables, or pieces of kibble. Add your drops of Hemp Bombs Pet CBD Oil and stir to combine. You may need to do some math here. For example, if you are making a dozen treats, you’ll need to add twelve doses of Pet CBD Oil. Place the ice cube tray in the freezer and wait until the treats are frozen solid. Pop out one or two treats daily and serve to your dog. Mix it with peanut butter. What dog doesn’t like peanut butter? This thick and creamy delight is a perfect vehicle for Pet CBD Oil. You can use crunchy or creamy peanut butter, just be sure to avoid sugar-free peanut butter as it may be toxic to your dog. In a small bowl, mix the drops of Pet CBD Oil with peanut butter until well-combined. You can then place the CBD-infused peanut butter on top of a biscuit or spoon it into your dog’s food dish. Bonus tip: If your dog suffers from separation anxiety, you can put the CBD peanut butter mix into a hollow toy designed for food dispensing. Served room temperature or frozen, the pleasantly distracting toy combined with the natural relaxing properties of CBD Oil may help soothe your dog’s nerves. Include Pet CBD Oil in your favorite no-bake recipe. The internet is filled with healthy DIY no-bake dog treat recipes, and Pet CBD Oil can be combined with virtually any of them. If your chosen recipe calls for an oil ingredient, like coconut oil, you can replace some or all of the oil with Pet CBD Oil – depending on your dog’s dosing needs. For recipes that do not have an oil ingredient, you can still add Pet CBD Oil. You just may need to include slightly more of your dry ingredients, like oats or flour, or a little less of the wet ingredients, like broth or applesauce. Be sure to consult with your family veterinarian before introducing new ingredients or recipes to your pet’s diet. 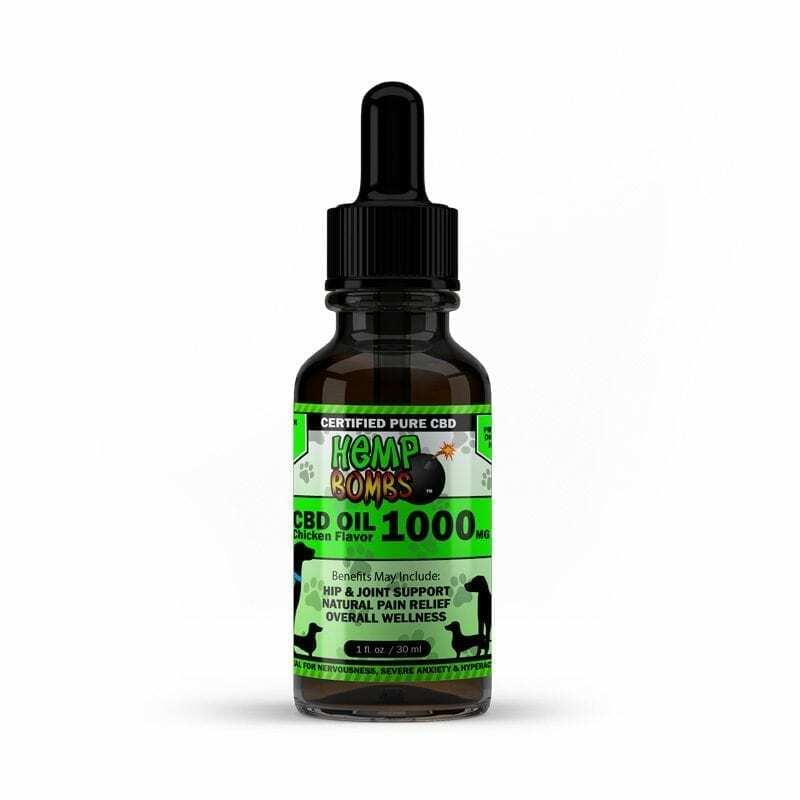 Hemp Bombs is a trusted brand in the CBD Industry, and our Pet CBD Oil is specifically formulated with pet health in mind. Our Pet CBD Oil contains CBD isolate, which means it is federally legal and has zero traces of THC. We verify the purity and concentration levels of our products with a third-party lab for transparency. Hemp Bombs has a strict commitment to quality and purity, which is why our CBD is sourced from superior-grade, organic Industrial Hemp grown with sustainable methods. Our Pet CBD Oil is available in three concentrations – 125mg, 300mg and 1000mg – to fit the needs of pets of all sizes. Interested in our Pet CBD Oil? Shop now.